I find it fascinating that there are people who have played this game and despite their momentous accomplishments on the field can to some degree remain in the shadows. Perhaps this is by design, but I find it hard to believe a player would want to avoid accolades. Maybe it is the player being a victim of circumstances in playing for a team in a small market or he is just being a bright spot on some very bad teams. Whatever the reasons may be one of the players that I felt may not have always gotten his due is Harmon Killebrew. Playing for first the Washington Senators/Minnesota Twins and finally the Kansas City Royals, Killebrew never really spent any great amount of time in a large market. I think this plays into the premise for me that even though Killebrew earned his Hall of Fame status he never really got the notoriety he was due. Today’s book takes a look at the gentle giant that lurked behind Killer Killebrew. From normal American upbringings in Idaho, Harmon Killebrew was like every other kid in the post World War II era. A local hero with respect for his elders there was nothing bad that could be said about young Harmon. This book follows the home town hero through his local rise to stardom and his trek to the big leagues. It has countless interviews with some of the folks that crossed paths with Harmon and not a single person had anything negative to say about the slugger. If they were friends in High School and have not seen him in 40 years everyone still considered him their friend. Aschburner takes the reader through Killebrew’s journey, getting established in the majors and getting adjusted to his new locales. He gives the reader a glimpse of the persona behind the player and how it didn’t matter who you were, Harmon Killebrew seemed to treat everyone just the same. It shows the humble character of Harmon that was something that never changed his entire life. I always find interesting in these books how a player deals with the downside of his own career. It is inevitable and something every player in every generation will have to face. Like everything else he did in life Harmon faces it with grace and dignity and moves to the next chapter of his life. The author shows the reader how life after baseball can be hard on any player, even the Superstars. Money and health are two key real life issues that effected the post playing days for this Hall of Famer. It was a good look at the humanity involved in Harmon Killebrew. Steve Aschburner did a real nice job with this book. I honestly feel that after reading this book I have a better feel of who Harmon Killebrew the person was. We are all familiar with the Hall of Fame player, who unfortunately played in a city that may have hampered us to getting to see his personality off the field. I would recommend this book for all baseball fans. 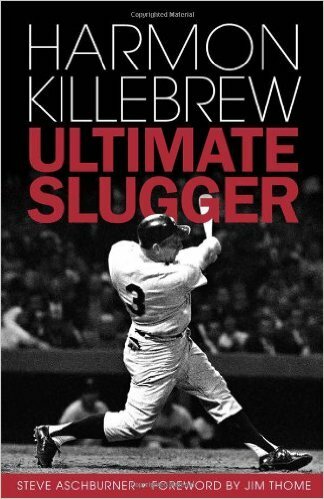 It’s a nice, easy reading book and it offers the fact that you would be hard pressed to find anyone that anything bad to say about Harmon Killebrew.